Problem: Leaves may become yellow in between the veins, with mottled brown spots on the affected leaves. These brown dead patches may spread and eventually kill the leaf. Leaves may also shred and fall apart. Overall growth of the marijuana plant may be stunted. With a manganese deficiency, the yellowing will begin at the base of the leaves and move outwards towards the tips. Your plant may also exhibit signs of a manganese deficiency if the pH is too high, or if the plant is getting too much iron. Learn how to manage your pH when growing cannabis. 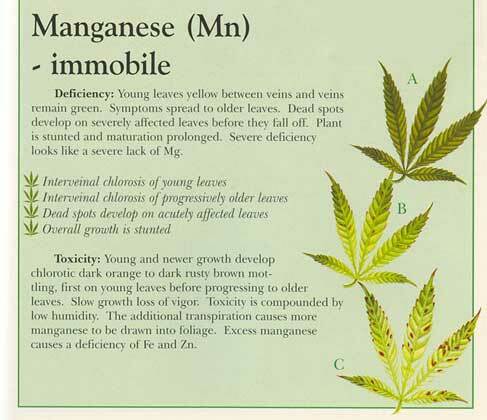 Please note: After a manganese deficiency is cleared up, the problem (brown spots and yellowing leaves) will stop spreading to other growth usually within a week. Please note that leaves which have been damaged by a manganese deficiency will probably not recover or turn green, so you want to pay attention to other growth for signs of recovery. If you suspect your growing cannabis plant has a manganese deficiency, flush your system with clean, pH’d water that contains a regular dose of cannabis-friendly nutrients that includes manganese. This will remove any extra iron or nutrient salts that may be affected the uptake of manganese, it will help restore pH to the proper levels, and will supply the plant with any missing nutrients. You are looking to avoid higher pH ranges, as this is where manganese deficiencies are most likely to occur.